You are here: Home / Compresssion Stockings / Compression Socks / Can Compression Garments and Legwear Make You Run Better? Can Compression Garments and Legwear Make You Run Better? I’m sure you have noticed too – compression wear is “the bomb”. If you are willing to shell out the bucks there is an ever increasing, awesome and cool selection of running socks, tights and other compression wear out there promising runners the edge of heightened performance that has eluded them so far. The nagging question is whether everyone is just jumping on the band wagon of a new fad or if there really is something to the science of graduated compression apparel? If the surging sales year after year are any indication for their effectiveness one has to suspect that even the most traditional minded runners are warming up to the benefits of graduated compression. Most runners will likely agree that each run is different and can have its own unique challenges. The outcome of a run can be affected by a variety of factors, including how well you feel on that particular day, whether you are overcoming an illness or injury or even just the weather conditions. These factors can make a difference and make a run good or bad. If you are a runner, we assume you know the drill so within the scope of this article we won’t go into the dos and don’ts of running or what the proper techniques are and how to use them. What we would like to explore here is whether or not compression gear with built in graduated compression can make a difference for your runs. Why is Running Gear with Graduated Compression Supposed to be Better? Graded compression is designed to assist and speed up the return blood flow from the extremities to the heart and lungs. This is particularly helpful for the blood circulation in the legs. The return flow of blood from the extremities has to overcome the force of gravity on its way up to the heart and lungs whenever the body is in a vertical position during our waking hours. In addition, compression legwear and arm sleeves are often the tools of choice for treating swelling conditions (edema) caused by fluid not draining properly from the body’s tissues due to a poorly or non-functioning lymph system in the person’s body. To achieve the effect of graduated compression, the respective garment must deliver the most compression where it is the farthest away from the heart. This is close to the ankles in the case of socks, shin sleeves or running tights and close to the wrist for arm sleeves and compression shirts. As a garment extends further up the legs or arms, the compression “gradually” decreases. It becomes the lowest in the area just below the bend of the knee with compression socks and at the upper thighs in the case of stockings or tights. Arm sleeves or compression shirts apply the lowest compression at the upper arm region. Like many intense exercises, long-distance running can sometimes result in muscle damage, swelling, inflammation and pain especially among less experienced and improperly prepared runners. This can happen sometimes even with seasoned marathoners if they push themselves too hard. Generally speaking on the subject of running, the jury (aka opinion of the medical community) is still out on the question whether marathon or long-distance running is of any real benefit or simply too risky for many individuals. Wearing graduated compression hosiery is often associated with circulation problems and underlying venous issues. As that may be, you can also use the benefits of compression to help you stay on top of your game as a runner. Compression therapy can be useful in a preventative way or as one of the treatment options for existing symptoms and illnesses. As an endurance athlete, graduated compression may give you the added boost you have been looking for during that long distance run. It may also help you recover easier after a strenuous exercise. Research studies performed in recent years by manufacturers and independent bodies have delivered test results with hard data, trying to validate some of the benefits claimed by the producers and marketers of compression garments. Sore muscles after a spirited exercise such as a long distance run are a normal reaction of the body. The degree of soreness largely depends on the level of training and preparation one is accustomed to and on the intensity of the exercise itself. Graduated compression socks and tights can help boost the return blood circulation to the heart and lungs for oxygenation. At the same time they can help flush out lactic acid and waste products from the muscle tissue faster, resulting in less fatigue and aching. The accelerated supply of oxygen to the muscles through graduated compression greatly benefits the muscle tissue’s ability to repair small tears quickly, resulting in a speedier recovery. The regenerated muscles become stronger and more powerful over time after each exercise and with the help of compression garments. If you have ever watched yourself, for example while jumping rope or athletes on TV in a slow motion playback scene, you may have noticed the muscles wobbling or quivering. Compression socks and tights can help to control and even reduce this type of muscle movement, thus preventing the muscles from tiring prematurely and to maximize stamina during extensive exercises such as long distance running. In addition, compression legwear and support garments can also provide protection and comfort for individuals who are prone to chronic conditions like shin splints, plantar fasciitis, tendon and calf issues or simple yet nagging problems like blisters and chafing. Can Compression Socks and Apparel Make You Run Faster? Compression garments are far from everyday elasticized pants, shirts or socks. With their precisely designed and scientifically engineered graduated compression, they can make your runs better due to the above described benefits. Nonetheless, they will most likely not make you run faster in spite of what some of the notable manufacturers of compression wear are claiming in their ambitious marketing campaigns. Yes, yes, it is true that studies have shown that compression tights, socks and other apparel can boost blood circulation and can therefore get more oxygen rich blood to the muscles, which in turn can improve their performance. However, in spite of the heightened performance benefits, scientists to date have not been able to close the loop and deliver conclusive proof that this also translates into increased speed and higher endurance. 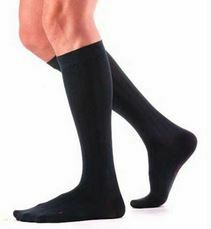 In our humble opinion and based on our knowledge of graduated compression legwear we feel confident in saying that if applied properly, with the optimal compression level (probably in the range of 15-20 mmHg) and with the guidance of your physician, compression socks or stockings can contribute a great deal to the physical well-being of your legs. They can help by maximizing leg strength and power during your athletic performance. Their greatest benefits though are reported during the post-exercise recovery phase where compression socks or calf sleeves seem to allow the athlete recover smoother and often with little soreness or calf issues. Can Compression Stockings Help with Shin Splints? Compression Socks – Are They Beneficial For Running Or Jogging? Support Socks or Compression Socks – Are They For You?